I started riding my bike like most suburban teens and took my first long trip with my friend Karl when we were 16, riding 250 miles in five days to the end of Long Island, camping along the way. Since then, I have always been a big bicycling person. After college, I led a couple of biking trips for teens for one of the hosteling groups, and then to get to grad school I rode my bike across Canada for a summer-long course of about 2500 miles. After grad school I was working in DC and led the effort to get bikes on board the subway trains there. So I wasn’t just a rider, but a biking advocate. In my late 40s, I decided to take up bike charity fundraising, and started doing a series of annual rides. My first ones were to benefit AIDS research and went from NYC to Boston. I later did rides to benefit diabetes, cancer and MS research, and thanks to many of you, was able to be one of the top fundraisers for my rides. My sister Carrie’s experience though with riding was completely different. She didn’t touch a bike until after she turned 55. 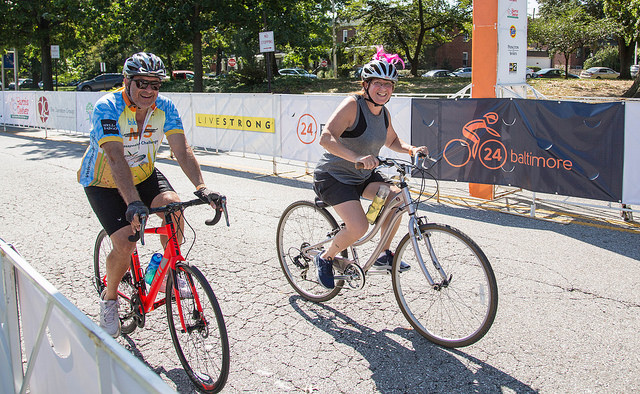 “I figured I survived breast cancer, I might as well tackle a bike.” So she taught herself to ride, got a pretty new bike and signed up for the 24 Baltimore ride and started a team with me and another couple. Carrie and I had done several multi-day breast cancer walking events over the years in different cities. We try to find an event that has some meaning to us, challenging and exciting. One year we did one of the Avon walks in Philadelphia: it was so cold and rainy that we had to be evacuated from our campground to a local high school, where we spent the night sleeping on the floor. At least it was warm and dry. When we signed up for the 24 ride, I didn’t realize that it would be such a benefit for helping Carrie learn how to be a better bike rider. She had limited experience using gears, for example, and tackling hills. Since she got her bike, she has fallen several times and cracked a few ribs. I am amazed that after these experiences she would want to get anywhere near a bike. But that is the kind of person she is. This photo of us then represents something very unusual: both of us on bikes, going through the “finish” line on one of our laps. After doing so many of these events with and without her, it is the first time we have been together on two wheels. The structure of the 24 ride is doing a tight 2+ mile loop over and over again. While it can get tedious, it turned out to be just the right thing for a beginner such as Carrie. This is because she got to try out her gearing and her climbing strategy over the series of laps. Many of the other riders saw that she was a newbie and gave her lots of encouragement, and it was fun to be on my bike with her throughout the day. No, we didn’t go all 24 hours, but we still did more than 25 miles around the course. I was very proud of her prowess, and how much she enjoyed the event. And glad that we got to do this together too. This entry was posted in Cycling by dstrom. Bookmark the permalink.